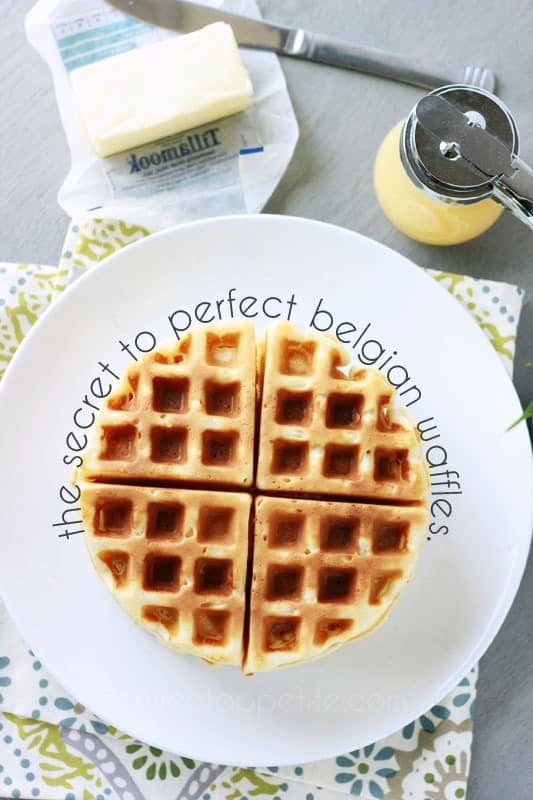 These Perfect Belgian Waffles are a family favorite! Light, fluffy, and simply delicious. 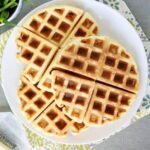 You will never need another waffle recipe! You will have to trust me when I say that these are Perfect Belgian waffles. They have a crunchy sweet exterior and still have a soft and chewy center. Slathered with butter and topped with homemade buttermilk syrup… They are spectacular. Find a good waffle iron. You want one that has nice deep pockets. In the somewhat altered words of the big bad wolf; All the better to soak up buttery syrup goodness, my dear! I like this one . It gets the job done perfectly and the price is right. PS- this is the cleanest my iron has been since the day I pulled it out of the box. That is all for you. You should feel special. 2. Separate your eggs. 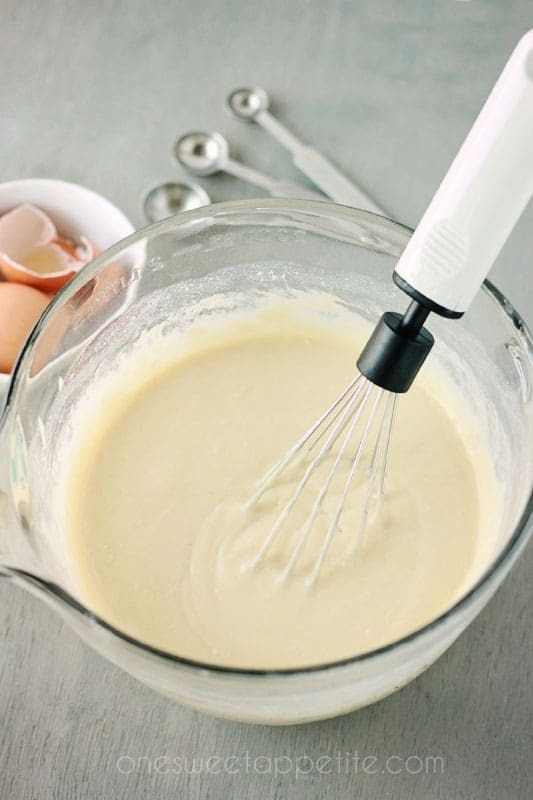 Stir the yolks in with the rest of the batter. 3. Whip the egg whites until they are light and fluffy. Make sure you keep whisking until you get nice peaks. 4. Fold the fluffy goodness into your batter with a spatula. Make sure to gently stir until they are fully incorporated. 5. Pour into your heated iron and cook according to the waffle iron directions. Just like that you have sweet crispy breakfast goodness. Top with some homemade syrup or maybe something a little out of the box like the strawberry syrup I posted earlier this week! So there you have it folks. My secret to great waffles is in the iron and whipped egg whites! Bonus, these are perfect for the freezer. We make a double batch and save them for busy weekday mornings. The kid throws one or two in the toaster, slathers in a little butter, and enjoys dusted with a tiny bit of powdered sugar. Cook the waffles and allow them to cool completely. 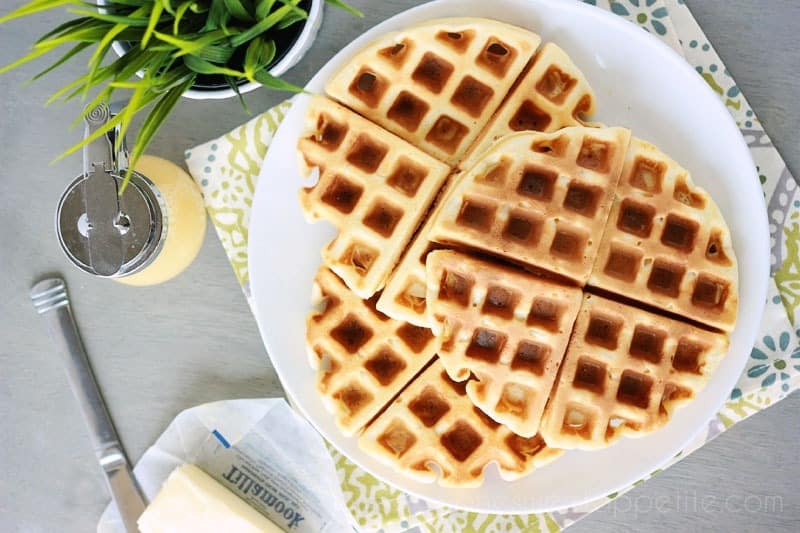 Place the waffles on a parchment lined pan. Freeze 1 hour. Transfer to a freezer safe zip top bag. 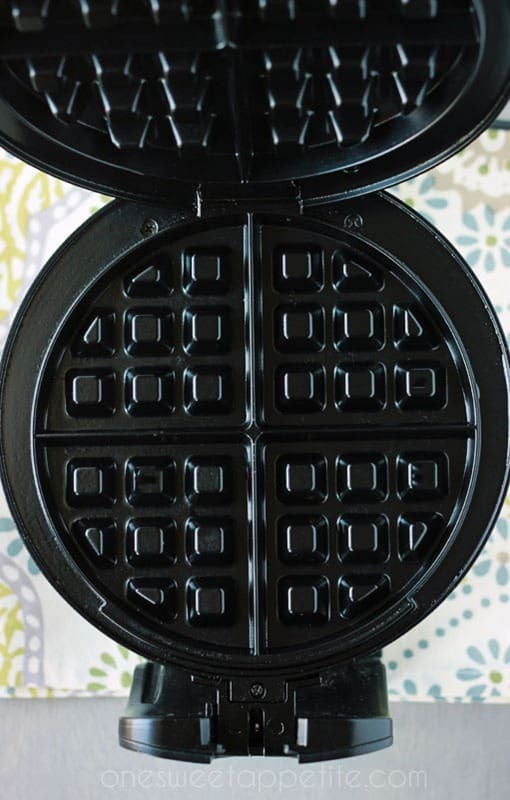 Frozen waffles will stay good up to 3 to 4 months if stored properly. 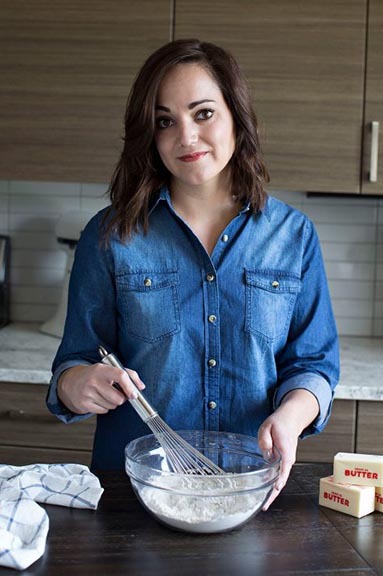 Whisk together the flour, sugar, and baking powder in a large bowl. 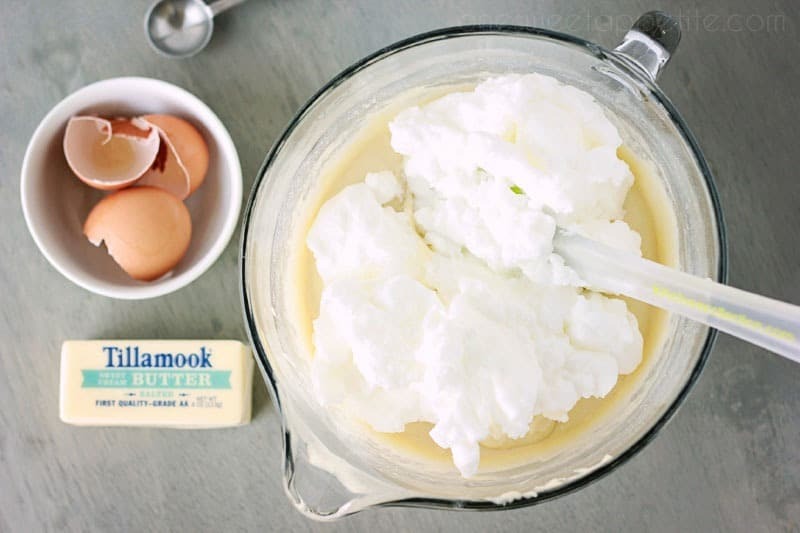 Stir together the egg yolks, milk, butter, and vanilla in a large measuring cup. Stir into the dry ingredients until combined. Whip the egg whites until stiff peaks form. Fold gently into your batter until incorporated. Heat a waffle iron and lightly mist with cooking spray. Spoon 3/4 cup batter onto the heated surface. Cook until crisp. Top with butter and syrup and enjoy. I have to let you know, I have had a belgin waffle iron for a few years. And have tried many recipes. None of them came out soft and just the right crispness. So the iron went back to the downstairs pantry. Until today I gave your recipe a try.This one is the bomb ! The iron is back in my kitchen pantry. Best waffle recipe yet. 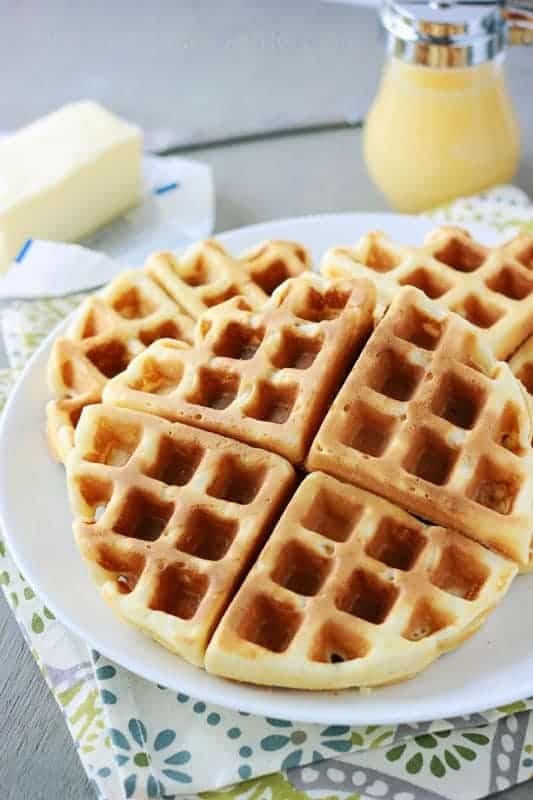 I am new to the waffle maker & have tried the recipes that came with it but this one tops the lot. I’m so glad to hear that, Laraine! It’s one of our all-time favorites. You are the sweetest! Thank you so much, Moni! I had to use chocolate almond milk, turned out wonderful. Hubby loved them.